Like Gigli in this photo (below), he wore his trilby pulled down slightly on the ‘Connemara’ side. Wonderful voice, Gigli had. What a poignant moment for you, Barry. And you’ve done it; you’ve written it all. Congratulations on a superb The Pimlico Kid. Your dad shines out of it. I know he’ll be smiling down on the launch, just as you’re smiling up. Really looking forward to reading ‘Pimlico Kid’, Barry. 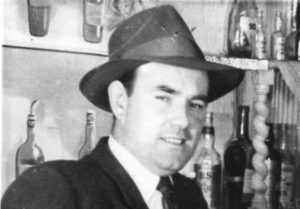 Your Dad looks eerily like Flann O’Brien in that photo. I think it’s the hat! A touching story, Barry, The Pimlico Kid will be a fitting tribute, I’m sure. Barry – so much looking forward to reading the book. Have a great time at the launch. Wish I could have made it! I see you in that photograph. I remember that sad week vividly. Delighted to be joining you this evening and can’t wait to read it. Barry, I would like to wish you all the very best for your launch! I would be there if France wasn’t so blinkin’ far away… Anyway, I’m sure The Pimlico Kid won’t need me in order to be a roaring success. Great good fortune. I’m sure your Dad will be singing for you again tonight. Enjoy every moment of the launch – can’t wait to read Pimlico Kid. Nice remembrance, PK. Did you actually intend to become a writer at that time? Lovely photo, btw. Thank you for your good wishes comments. This was a one-off bit of recognition but gratitude and respect are permanent. The launch was great and with any luck some photos will be posted! Barry, congratulations on the book. I’m in the middle of reading it right now. It’s a lovely poignant novel. It may have taken you some time to become a published author, but I think it was well worth the wait. Well, well, well, me ol’ mucker…what can I say? Loved reading your tome to our old ‘home’….Pimlico. It is a fine work, Barry. Massive congratulations on getting this published. It finally arrived here, in Big D , Texas, Saturday Aug 10. The next morning, I sat down with my morning cuppa, and dove into it. Within a few pages , I was hooked. Suddenly , I am back 50 years ago, on our streets. I can feel them, taste them. Nostalgia was rampant ! Had some fun trying picture the ‘Hydraulic’…I’d forgotten about that place. I also liked the way it grew as a ‘first love’ story. We never forget that, do we? Finished it in 3 days. My daughter has now taken it with her to California. Thank you Barry, for a darn good read.